Justin Sailor and his squirrel (yes, his plastic squirrel) traveled through all 50 states from September 8, 2007 to September 17, 2007 for a journey that was close to 30,000 miles. Justin’s goal was to take a trip across the United States and stay with a family in each state and document his adventure in pictures and words online and allow people to follow his journey. Justin stayed in over 100 different households. During Justin’s travels he picked up 50 t-shirts along the way and each one had a story. Check out Justin’s blog to read how t-shirts helped shaped his trip. 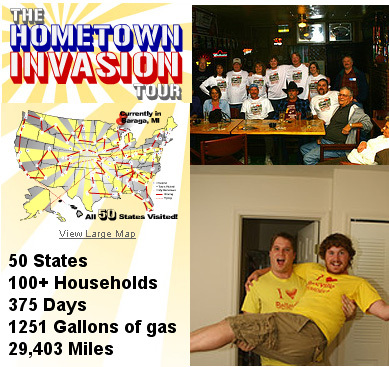 It It is a great example of how t-shirts can connect us with others and serve as a great way to remember where you have visited and who you have met. I met Justin last year in Aspen during the X-Games. We were walking up at the same time and he was pretty cool. You could tell he was having a good time. Glad to see it went so well.